Vinyl Digital Exclusive: Limited Edition of 150 Copies on red colored Vinyl! Check out AK of The Underachievers's 12-track solo project "Blessings In The Gray 2". 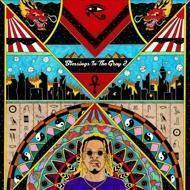 Arriving two years after the original mixtape, AK of The Underachievers has released Blessings in the Gray 2. The solo project comes six months after The Underachievers (AK + Issa Gold) released their latest tape, It Happened in Flatbush. A month after that, AK (aka "The Savior") put out a few songs to coincide with his online manga series. There are 12 tracks in total on Blessings in the Gray 2, including the previously released "Illuminate" and "Inner Peace." AK is able to situate his gritty true-to-life tales of life in Flatbush within a refreshingly otherworldly vision. Mello and Cree Ikuko are the only guest artists on the project.